Hi friends! 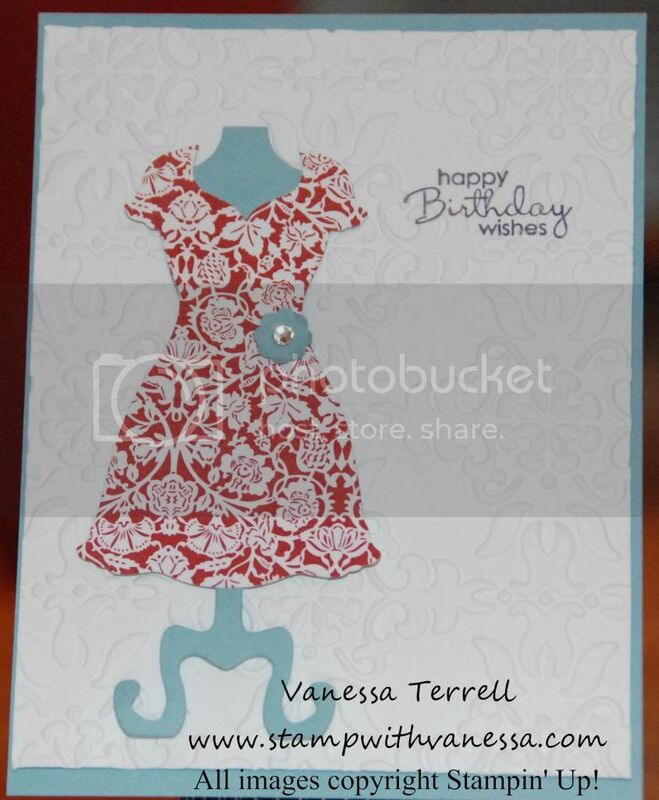 Today I finally played with the Dressed Up Framelits from the Spring Catalog to create a quick birthday card. The Framelits are fun by themselves, but when paired up with the All Dressed Up Set there are even more possibilities! Today, I only played with the Framelits...I'll save the stamps for another time, but when you purchase the stamps and framelits together as a bundle you save 15%. Here's what the Framelits look like. I used the Twitterpated DSP for my dress, my dressform was cut from Baja Breeze card stock as well as the flower that I punched using the Ittt Bitty Shapes Punch Pack. I stamped the greeting from Petite Pairs in Basic Grey, then I ran it through the Big Shot using the Vintage Wallpaper Textured Embossing Folder. This is all layered on Baja Breeze Card stock. Hi Vanessa, this is so cute! I love the patter you've used for the dress. Lovely! Do you do wedding invitation cards as well? Thanks Bianca, I'll send you a message in Facebook! Wow, how beautiful! Thanks for sharing! I never really thought about what could be done with stamps or other art. Gladys thanks for stopping by, glad you liked my project!